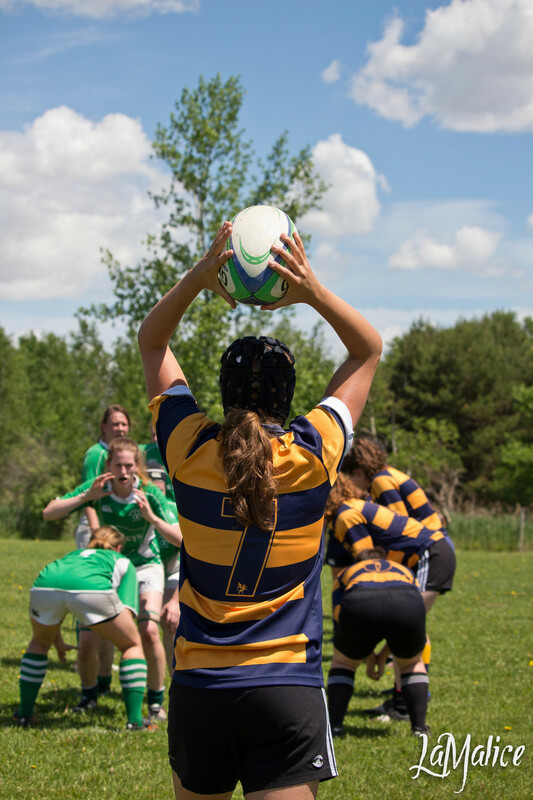 On Saturday June 7, 2014 the TMR women hit the rugby field with the reserves and the prems playing at two different locations this day was going to test what the townie women were made of. Non the less it was a beautiful sunny day for some rugby. The prems kicked off against the Montreal Irish in Ste- Julie at 1205pm. In the first half there were lots of calls and penalties against TMR. That didn’t stop them, we kept pushing and fighting and working as a team. For the first try of the day, Robin passed the ball out to Doum off the scrum, Doum pulled a dummy and brought in the try for Town, putting the score 5-0. Audrey unfortunately got sin binned for repeated diving while tackling. TMR won over the ruck and Susy got another try for town putting the score at 10-0 for TMR. Town managed to play most of the half in the Irish zone, but one break away happened and as a team Town help up the ball and didn’t let the Irish score. Loveline brought in the next try off a kick bringing the score 15-0. In the second half TMR brought up their energy and kept the power and fight going strong. TMR stole the Irish’s line out to start off the second half. Ani got the next try for Town putting the score at 20-0. Laurence made a big break today she made a running break and scored her first try for TMR putting the score at 25-0 and Molly having a successful conversion bringing the score up again to 27-0. That was not it for Laurence. When the Irish got the ball back in the townies zone, Laurence pumped her legs for 10 yards stopping the Irish from scoring. Doum took the ball and had an amazing run giving the townies back their edge. Saby scored the next try and Molly having another successful conversion, bringing the score 34-0. The final try before the end of the game was by Doum offloading the ball to Claudie and Claudie scoring the winning try 39-0 for the Town. The seconds kicked off against Westmount at Westmount Park at 300pm. The reserves had amazing support because the prems came to cheer on the seconds and even though the teams had different games, everyone found a way to come support their team mates!! To start off the afternoon Dom picked and went with the ball to score the first try with a score of 5-0. Ariel passed the ball off Rachel to score another try putting the score 10-0 for TMR and Jenn having a successful conversion raising the score 12-0. The ball was in Westmount’s zone and a maul was formed, Sandra brought the ball over the try zone increasing the score 17-0. The next try was off a line out when the ball was overshot; Ariel caught the ball and ran it in to score once again for town putting the score at 22-0. The final try of the first half was brought to you by Maryeve bringing the score to 27-0. Again heading into the second half TMR was not allowing Westmount to catch up one bit. Maryeve started off with another fantastic run bringing the score 32-0. Ariel also had a super run scoring yet another try for you guessed it ;) TMR bringing the score 37-0. When Westmount kicked the ball, Fred caught it and ran the ball in raising the score 42-0 and Jill had her successful conversion giving a higher score to town 44-0. Jill picked the ball and passed it to Corinne, Corinne ran the ball and scored the next try for town bringing the score to 49-0. Christina had her first try of the game increasing the score 54-0. Cam came along with the next try helping out town and putting the score 59-0. The next try was beautifully made by Fred. She pulled a dummy and made a Westmount player fall to the ground, Fred got the break away and scored (a true sight to see) 64-0 for the Town. Marika was the next player for TMR to score a try putting the score up at 69-0. Christina brought in her second try of the game 74-0. Claire had her first try of the game raising the score for TMR 79-0. Cam was on a roll scoring another try for town 84-0. To finish up an amazing day Christina had a great run passing the ball to Cam and Cam scoring the try with a successful conversion from Dom. Ending the game with a score of 91-0 for TMR.